Knowing the location of your main gas service shutoff valve will help you turn off the gas supply to your entire facility quickly in case of an emergency. 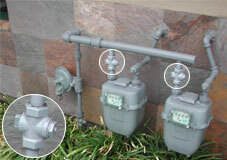 The gas meter and gas service shutoff valve is usually located on the side or in front of the building. If the building has a breezeway, it could be located there. 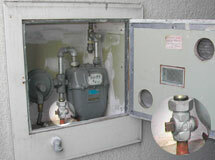 In some cases, the gas meter can be located in a cabinet enclosure built into the building or located inside the building. 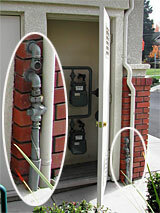 In these cases, the gas service shutoff valve can be located outside on a section of gas service pipe next to the building, or near the gas meter. If there are multiple meters serving gas to multiple units within a building, there are individual gas service shutoff valves for each unit near each of the gas meters, including a master valve for the entire building where the gas pipe comes out of the ground. Your facilities personnel or your property manager (if you are leasing) might be able to help you locate your unit’s valve location. 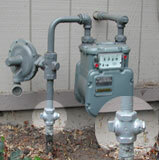 If you still are not able to locate the gas service shutoff valve, contact PG&E for assistance to locate the valve. Do not shut off the gas unless you smell gas, hear gas escaping, see a broken gas line or if you suspect a gas leak. If you shut off the gas, there may be a considerable delay before PG&E can turn your service on. Once the gas is shut off at the meter, do not try to turn it back on yourself. If the gas service shutoff valve is closed, PG&E or another qualified professional should perform a safety inspection before the gas service is restored and the appliance pilots are lit. 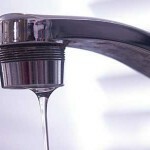 In an emergency, your gas can be turned off at the main gas service shutoff valve normally located near your gas meter. Using a 12 to 15 inch adjustable pipe or crescent-type wrench or other suitable tool, give the valve a quarter turn in either direction; the valve is closed when the tang (the part you put the wrench on) is crosswise to the pipe. If your gas service is configured differently from the one described and you wish to know how to turn of your gas, please contact PG&E. Most gas appliances have a gas shutoff valve located near the appliance that lets you turn off the gas to that appliance only. In some cases, turning off the gas at the appliance’s shutoff valve will suffice if there is a gas leak or the appliance needs to be replaced or serviced. You should have an appliance gas shutoff valve installed at each gas appliance that lets you turn off the gas to that appliance only, instead of shutting off all gas at the main gas service shutoff valve. 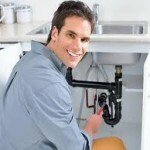 To turn off the gas at the gas appliance, rotate the valve a quarter turn.